Of the six Bears wide receivers who caught a pass in 2014, only two remain on the roster, Alshon Jeffery and Marquess Wilson. Jeffery will be the surefire No. 1 receiver for quarterback Jay Cutler this season with Brandon Marshall now in New York with Geno Smith and the Jets. The fourth-year South Carolina product, Jeffery led the team in targets (145), receiving yards (1,133), yards per catch (13.3), touchdown receptions (10), yards per game (70.8) and first downs (60) last season. He will be an unrestricted free agent after this season and you can bet the Bears want to pound out a long term deal with him during the year or quickly after it ends. Jeffery is a rising player in this league and is destined to be a star for years to come. First round pick Kevin White and off-season signing Eddie Royal will be the starters alongside Jeffery. Third-year Washington State product Marquess Wilson will be the No. 4 receiver and should see plenty of snaps with a nice showing at training camp. 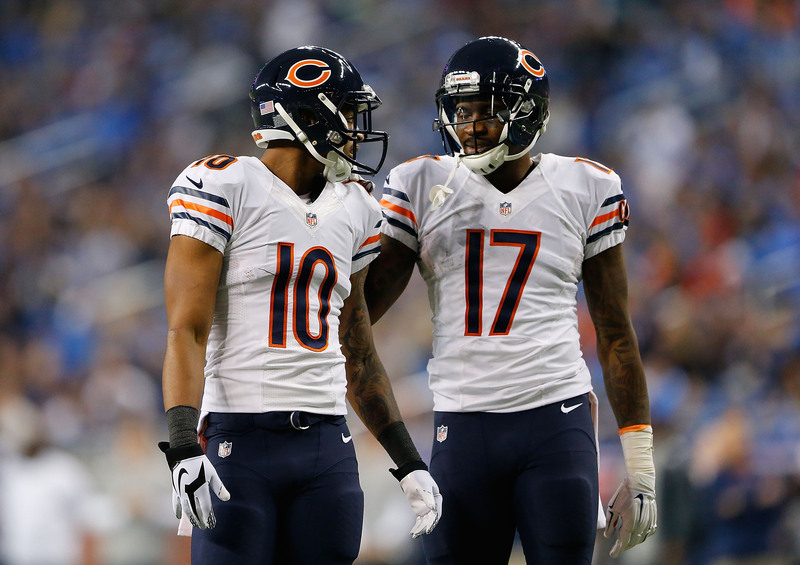 The Bears also have Josh Bellamy and Marc Mariani two special teamers that played in Chicago last season. Rashad Lawerence and John Chiles are second-year players. Undrafted rookies Levi Norwood, Cameron Meredith and Ify Umodu round out the group. Here's an Inside Look at the current Bears wide receivers in the seventh installment of this series. You can read the previous story about the tight ends. Jeffery - 36 starts, 198 receptions, 2,921 receiving yards, 20 touchdowns. Those are the numbers Jeffery has been able to put up in three seasons with the Bears. He battled injuries during his rookie campaign, 2012, but he's improved his body strength with intense training that helped him trim some body fat. With offensive coordinator Adam Gase coming over to Chicago from Denver you can bet that they will try everything in their power to use him like Demaryius Thomas. Thomas has three straight 90 plus reception, 1,400 plus yard and 10 plus touchdown seasons. Of course, the Broncos had a pass-first mentality under Gase, but Jeffery and Thomas are almost the same player physically, both standing at 6-foot-3. Jeffery is a little leaner at 216 lbs. Watch out for Jeffery in 2015, he should be a man on a mission all season long. White - The No. 7 overall pick of this year's draft, White has endless potential at 6-3, 215. He starred at West Virginia where he caught 109 catches, 1,447 yards, 10 touchdowns in the Mountaineers spread offense. White ranked second in single-season school history in receiving yardage and third in receptions with is 2014 performance. Following the draft, Bears general manager Ryan Pace called White dynamic, big, strong and ultra competitive. All of those words are great for a player who is still rather raw in terms of big-time football. He is just two seasons away from catching 35 receptions for 507 yards with five touchdowns. White might not be a full-time starter out of the gate and it could take time to settle in, but the powerful blocker should be a legitimate NFL receiver very soon. Royal - The 29-year-old slot receiver excites me a lot. The Bears haven't had a legitimate starting slot man in quite some time. They've had solid contributors like Rashied Davis and Earl Bennett, but no one like the crafty Royal. Entering his eighth NFL season, the Virginia Tech product has made 61 starts. Royal had 15 touchdowns in the last two seasons with San Diego. He's fresh off a 2014 season where he made 11 starts, compiling 62 receptions, 778 yards and seven touchdowns. The reception and yard totals were his highest since rookie season, 2008, when Cutler was his quarterback in Denver. Having Royal and Cutler back together will be huge for both of them. He should be open more often than not and will be a reliable third-down target. Wilson - The 22-year-old is a big target at 6-4 and has rather solid speed as well. He has 19 career receptions, 153 yards and a touchdown in two NFL seasons. Wilson had the chance to be a future starter with six starts late in the season, but he failed to impress, totaling 17 catches for 140 yards and his first career touchdown. He did put up a solid game against Detroit in Week 15 with seven receptions and 66 yards. Wilson seems destined to be a sub-package player at No. 4 on the depth chart. It remains to be seen if Wilson can be a solid player in this league, but he should get plenty of chances to be a contributor this season. He has a lot of upside. Bellamy and Mariani - Between the two veteran special teamers they appeared in 10 games in 2014. Even though neither player played on offense they were leaders on the third phase. Bellamy has a chance to be the fifth receiver this season with his experience and Mariani is penciled in as the kick returner and probably not anything more. Mariani had 20 kick returns for 510 yards (25.5 ypr) with a season long of 67 yards against Minnesota in Week 16. Lawerence and Chiles - The two second-year players are competing with Bellamy for the No. 5 receiver/special teams spot. Norwood, Meredith and Umodu - All three are undrafted rookies with Norwood coming from a pass-happy attack at Baylor. He had 10 touchdowns as a junior (eight receiving, two returning), but he fell out of the pecking order as a senior. Meredith is an Illinois State product who starred in 2014 in his second full season as a receiver transitioning from quarterback. The 6-3 receiver from Berwyn, IL had 66 grabs for 1,061 yards and nine touchdowns as a senior. Umodu latched on with the Bears on Jun. 8. He complied 136 receptions for 1,883 yards and 15 touchdowns in four seasons at Northern Arizona. He led the team in receptions (47) and receiving yards (692) and tied for the team lead in touchdown catches (five) as a senior. The Bears could be inclined to develop one or two of youngsters as either the No. 5 receiver or a practice squad player over a player like Bellamy, Lawerence or Chiles. The Bears' top three receivers are as solid as they come on paper. Jeffery could be a monster as the No. 1, Royal should be a steady slot guy and White has a chance to make big plays as a rookie. However, Jeffery got a lot less attention with Marshall in town and he hasn't been the guy yet. Over the final three games in 2014, Marshall was out with an injury and Jeffery was the No. 1. He averaged four catches and 61 yards and caught two total touchdowns in those final three games. For what it's worth he averaged over five catches and 73 yards with eight touchdowns in 13 games prior. With Wilson being healthy and potentially a key piece, the Bears' receiving core is deeper this season than it was a year ago. The keys are Jeffery being able to be that true No. 1 and White picking up the ins-and-outs of the offense rather quickly. It should be a fun and speedy group to watch.